CAIRO (AP) — U.S. Secretary of State Hillary Rodham Clinton used her first meeting with Egypt's new Islamist president to press Mohammed Morsi to start a dialogue with military leaders as a way of preserving the country's transition to democracy. 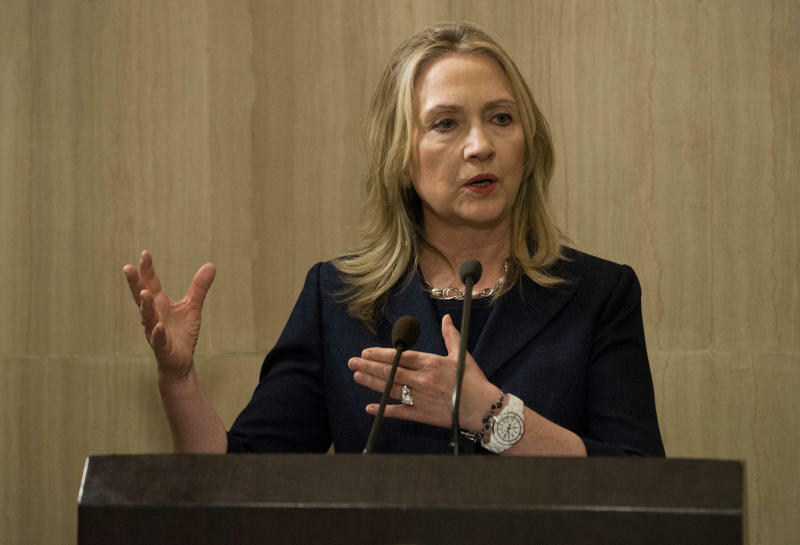 Clinton voiced support for the "full transition" to civilian rule at a time when Morsi's backers are in a political standoff with the generals who have ruled since President Hosni Mubarak was ousted last year. 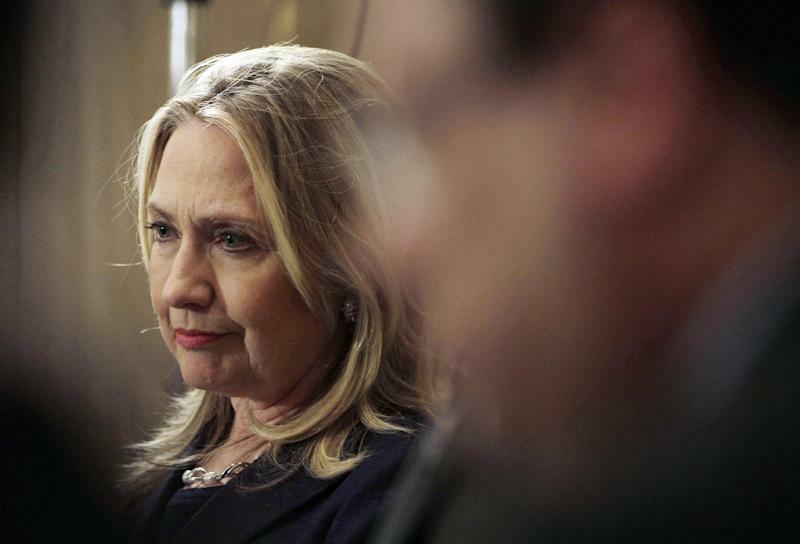 Resolving the impasse "requires dialogue and compromise, real politics," Clinton said. She said the United States is doing all it can to "support the democratically elected government and to help make it a success in delivering results for the people of Egypt." The meeting at the presidential palace kicked off a series of high-level sessions aimed at stabilizing Egypt's fledgling democracy and its alliance with the United States, once rock-solid but now increasingly shaky. "Things change (at) kind of warp speed," Clinton told Morsi as they began their meeting. Clinton and Morsi didn't shake hands, at least when they first appeared before reporters — a subject of much speculation because of Morsi's Muslim faith. But the president shook hands with Clinton and the entire U.S. delegation behind closed doors, according to a U.S. official. The president, speaking in English, said, "We are very, very keen to meet you and happy that you are here." Clinton and Morsi were seated perpendicular to one another, the American on a sofa and the Egyptian on a chair. Morsi is in a showdown with the generals since at least ceremonially gaining power on June 30. Right before his inauguration, the generals retained stripped him of many powers and kept them for themselves. That move followed a decision last month by Egypt's Supreme Constitutional Court to dissolve the Islamist-dominated parliament, the first democratically elected, after ruling that a third of its members were elected illegally. Morsi has issued a decree to bring the lawmakers, many of whom are his allies in the Muslim Brotherhood, back into session. The U.S. has been careful not to take sides, focusing on principles instead of personalities and parties. The Obama administration has called on all sides to negotiate a path forward that remains faithful to the ideals of Egypt's 2011 revolution. Appearing at a news conference alongside Foreign Minister Mohamed Amr, Clinton said it was up to Egyptians to determine their future. But she stressed American financial and political support for Egypt's new government. She was careful, however, to also praise Egypt's military council for its interim leadership. The message speaks to Washington's broader effort to build a new relationship with Egypt after three decades of close cooperation with Mubarak despite his criticized record on democracy and human rights. This has involved some uncomfortable changes for the U.S., including occasionally harsh criticism of once faithful partners in the Egyptian military and words of support for Islamist parties far more skeptical of the U.S. agenda for the Middle East. "We believe America's shared strategic interests with Egypt far outnumber our differences," Clinton said. Asked if she regretted the close partnership successive U.S. governments had with Mubarak despite his suppression of the Muslim Brotherhood and even imprisonment of Morsi, Clinton said Washington by necessity worked with the government of the time. She insisted, however, that "we were consistent in promoting human rights and speaking out for an end of the emergency law, and end to political prisoners being detained." In her discussions with Morsi, Clinton emphasized the need for Egypt to adhere to its 1979 peace treaty with Israel, while also seeking continued counterterrorism cooperation and offering U.S. support to help Cairo regain control of the increasingly lawless Sinai Peninsula — a major security concern for Israel. For Egypt's sake, Clinton pledged hundreds of millions of dollars in debt relief, private investment capital and job creation funds — money the Obama administration has outlined previously. She told Morsi she would send a large business delegation to Cairo in September to strengthen U.S.-Egyptian economic ties. Clinton held discussions later Saturday with Amr. She was to meet Sunday with the head of the military council, Field Marshal Hussein Tantawi, before visiting the port city of Alexandria to meet with leading women, the Coptic Christian community and young entrepreneurs. She then was to head on to Israel. A large and vocal crowd massed outside the hotel where Clinton was to stay in Cairo, chanting and carrying anti-American signs. Her stop in the Mideast comes after a weeklong trip to Asia, where she courted investments and sought democratic reforms from governments long seen as closer to China than the U.S.